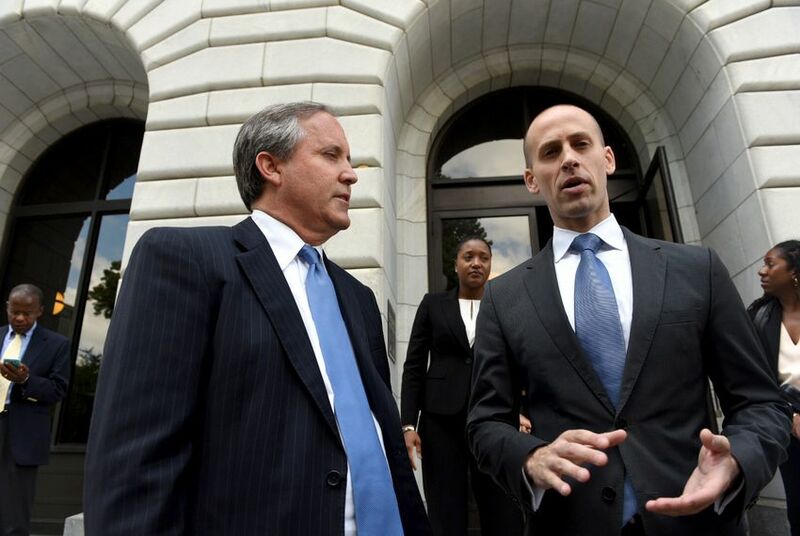 Texas Solicitor General Scott Keller warned the U.S. 5th Circuit Court of Appeals Tuesday that “all voting laws could be in jeopardy" if Texas' voter ID law is struck down. NEW ORLEANS — A top lawyer for Texas fiercely defended the state’s strictest-in-the-nation voter identification law on Tuesday in a high-profile case that could ultimately determine at what point states that assert that they are protecting the integrity of elections cross over into disenfranchisement. Lawyers representing the U.S. Department of Justice, minority groups and other plaintiffs disagreed, asking the judges to affirm what a lower court — and a three-judge panel in this same courthouse — previously concluded: that Senate Bill 14 has a "discriminatory effect” on Hispanic, African-American and other would-be voters in violation of Section 2 of the Voting Rights Act. In the courtroom, opponents of the rule argued that not all voter ID laws violate the federal law but that the state’s unusually short list of what election workers can accept at the polls is particularly burdensome for certain voters — particularly minorities. The Texas law requires most citizens (some, like people with disabilities, can be exempt) to show one of a handful of types of identification before their ballots can be counted. Those include: a state driver's license or ID card, a concealed handgun license, a U.S. passport, a military ID card or a U.S citizenship certificate with a photo. Texas is among nine states categorized as requiring "strict photo ID," and its list of acceptable forms is the shortest. Voting rights experts are watching closely, saying this is one of two such battles, alongside one in North Carolina, that the U.S. Supreme Court — currently split along ideological lines — may ultimately decide. In defending its law, Texas points to a 2008 U.S. Supreme Court ruling — Crawford v. Marion County Election Board — that determined that an Indiana photo ID law should be upheld even if it was “fair to infer that partisan considerations may have played a significant role” in its enactment. At that time, the high court said Indiana had a “valid interest” in "deterring and detecting voter fraud" and had implemented the law neutrally. “The plaintiff’s aim here, is to essentially try to re-litigate Crawford,” Keller argued Tuesday. But Plaintiffs pointed out key differences between the Texas voter ID law and Indiana’s, which includes a much broader list of acceptable identification. And they asked why Texas, when drawing up its law in 2011, would not have used the three-year-old Crawford decision for guidance — instead of drawing up its much narrower requirements. Chief Judge Carl Stewart, a President Bill Clinton appointee, also probed that question. Lawyers on each side sparred over what kind of evidence is needed to prove discrimination under the law. Keller argued that voter turnout figures showing a disparate impact on minority owners was needed. Opponents of the law argued that demonstrating that the law disproportionally diminished some Texans' "opportunity" to cast a vote was evidence enough. If that broader view were adopted, Keller suggested, all state election laws would be more vulnerable to challenges under the federal Voting Rights Act. Janai Nelson, arguing on behalf of the NAACP's Legal Defense and Education Fund, pointed to the environment under which the Texas law was passed, noting that lawmakers voted for it amid a legislative session that also saw intense race-infused debates surrounding issues like immigration and sanctuary cities — raising questions about their mindset and intent in creating the ID rules. Texas maintains that the law bolsters ballot security and that there is no evidence that it prevents legitimate voters from casting ballots. Though a federal district court and a panel of 5th Circuit judges have ruled that the Texas requirements violate the U.S. Voting Rights Act,the law has been enforced at polling locations around the state since 2013. The outcome in here could determine whether the rules remain in effect for the presidential election in November. The U.S. Supreme Court set a July 20 timetable for the appeals court to rule.